We got up early and decided to drive to McElroy’s on the Bayou in Ocean Springs for breakfast and it proved to be a good choice. The new restaurant, built to replace one in Biloxi that Hurricane Katrina had destroyed, was built overlooking beautiful Fort Bayou and the large homes that lined it. As we ate a delicious breakfast, we were able to watch boats that were taking an early morning run on the waters, and birds that were in the trees near the windows. After ending our meal with an order of beignets, we decided to drive into the downtown area of Ocean Springs to see what had been done since the storm, but we soon found that the city was teeming with people because of an event called Art Walk. The streets were lined with tents where artists had set up to sell paintings, pottery and sculptures, and people were walking everywhere. On Government Street, we passed interesting-looking places like Government Street Grocery (actually a restaurant) and Chandeleur Outfitters. I would have liked to have stopped and browsed around, but my mother had to meet her friends from school at the White Cap Seafood Restaurant in Gulfport at 11 AM, so we headed back west into Biloxi on Highway 90. The White Cap was owned by one of her old classmates, Carl Lizana, and was a beautiful new building at Mississippi City, since, once again, Katrina had blown the old one away. We spent a couple of hours there, eating and talking, and then we left, heading out the new Cowan-Lorraine highway out to Saucier to start the drive back to Memphis. In Jackson, we went to a restaurant near the stadium called Sal and Mookie’s that proved to be some of the best pizza either of us had ever eaten. I was especially impressed by the herb garden that they had growing outdoors beside the building. From there we stopped by Lemuria Books in Banner Hall, where I bought a book about New Orleans, and then, after a cappuccino from the Broad Street Baking Company downstairs, we started back home to Memphis. We soon learned that the history-making football game between Mississippi State and Jackson State had not gone well for the JSU Tigers, as they got blown out by the Bulldogs. There was to be one final conference event, a brunch and lecture by Stax soul man William Bell that I would have liked to have attanded, but it started and ended too late in the day, and I had to drive back to Memphis. 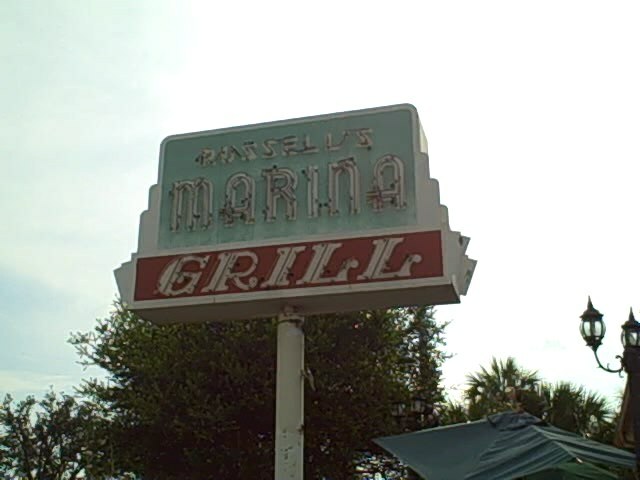 So I checked out of the hotel, and drove out I-10 to Pontchartrain Boulevard and northwards to the lakefront to a restaurant called Russell’s Marina Grill. To my amazement, it was quite crowded, and parking was at a premium because there was another restaurant across the street that also served breakfast. I had to wait for seating, but I finally found a place at the bar, and I found that the breakfast was definitely worth the wait. I decided not to cross the lake on the causeway this year, and instead, headed back the normal way to LaPlace and up I-55. In Jackson, I stopped at Lemuria Books, but ended up not buying anything there, and after a latte at Broad Street Baking Company, I drove on into Memphis. Today was my busiest speaking day at the conference, so I didn’t have time to leave the Quarter breakfast. Instead, my friend Rico Brooks and I walked from the hotel to a place called the Fleur-De-Lis on Chartres Street, where we ate breakfast, and by the time we made it back to the hotel, it was time for my morning distribution panel. After that, I had a few hours until 3 PM to prowl the Vieux Carre, so I walked down to the French Market, and then back to a book shop on Decatur near Jackson Square, where I bought a few books. Around the corner, in an alley behind the Cabildo I found a gelateria, and I had a quick, cool dessert and a few brief moments out of the stifling heat. But by now, it was time for my afternoon panel, and so I walked back quickly to the hotel. The afternoon forum was about the future of Southern hip-hop, and I was the moderator. As is so often the case these days, the forum devolved into a discussion about “positive vs. negative rap”, and the role that major labels may or may not play in determining the trends. After that was a demo listening session that was more fun than I had expected. Of course there were the truly bad artists, but there were also promising ones like a county band out of Shreveport called Dixie Tradition, truly outstanding artists like Josh Weintein from New York, whose demo sounded like a cross between hip-hop, Dr. John , Lou Reed and Tom Waits, and already well-known established artists like Baton Rouge’s Henry Turner Jr. There were also the odd, genre-busting acts like a “progressive, melodic, metal” group called Psychometry. At the end of the listening session I was both exhausted and hungry, so I fell in with a guy from the Tipitina’s Co-Op office who agreed to give me a ride to the Faubourg Marigny where the showcases were to be. His car was parked at Harrah’s, and as we rode back past our hotel, there was a traffic jam with police cars and ambulances everywhere. A passerby yelled to us that someone had been stabbed in front of the hotel on Canal Street. The rap showcase was to be in the upstairs of a club called the Blue Nile, but the downstairs was interesting enough, gutbucket blues from an elderly bluesman, but upstairs, the hip-hop DJ had the beats and grooves going, the show waiting for an audience. The small, brightly colored room with a bar and pool table was attractive, but its best feature was its outdoor upstairs balcony overlooking Frenchmen Street. and the brilliantly painted gingerbread house across the street which was also a club. It was now dusk, and directly across the street was a three-story apartment building with courtyards of tables and chairs on each level. At the ground level was a group of young whites partying and hanging out, while on the second floor landing, there was a similar group of Blacks, while the warm breezes were blowing in my face amidst the sounds of booming cars on the street and mingled musics from the various clubs and bars, the ring of laughter and voices from the street, an occasional “yeah you right” or “where ya’t”. Soon there was another sound, a young man who had ridden up on a bicycle and was singing a rendition of “A Change Is Gonna Come”, and clapping with himself to keep time. He had found an audience in the group of Blacks on the apartment building’s second-story courtyard, and they were yelling encouragement to him as I turned to the Tipitina’s dude and said “How could anyone want to move away from this?” Another conference panelist from Nashville threw some money down to the singer from our balcony, and I sat for a moment, wondering at what I had just seen.The local musician had complained that the New Orleans of today could not ever be what had been lost in Katrina, yet I felt I was witnessing the cultural spirit of New Orleans at work tonight on Frenchmen Street, a dramatic reminder that the “Soul is Waterproof” bumperstickers were more than just a cool slogan. At 10 PM, I made the walk down to Cafe Negril to catch Josh Weinstein’s set, but there the vibe wasn’t as cool. The building was attractive, painted with reggae images and slogans, but the place was crowded, and some of the people had had a little too much to drink. Weinstein’s music was impressive though, consistently good, infused with a New Orleans tinge that belies his New York roots. I got back to the Blue Nile just in time to catch Kilo and Euricka’s show, and after that, I ducked briefly into a bookstore that was still open despite the lateness of the hour, knowing that I shouldn’t go to meet temptation on its own ground when I shouldn’t be spending the money. Wanting everything, I ended up buying nothing and started the long walk back to the hotel. At the Cafe du Monde, I paused and stopped, deciding to enjoy a cafe au lait and beignets for my last night in the city, choosing a table that happened to be one over from Eric Cager, the organizer of our conference who was sitting with Rico Brooks and a couple of other panelists. New Orleans really is like a small town everyone says, and it does seem to work out like that. We ended up joining each other, and then walking back together toward the hotel. Near the Peaches Records, as if by some preappointed sign, all the trees erupted with swarming birds pouring out of them and into the sky. “Parakeets,” Eric Cager explained to us as the phenomenon continued from where we were back to Jackson Square and throughout the Quarter. “Some pets got out, and they have multiplied until they have taken over the city.” Back in my hotel room, I slept with the windows open onto the city, noticing flashes in the east that eventually grew nearer, then winds, and finally torrential downpours. I decided to eat breakfast at a place called the Oak Street Cafe, which was in the far uptown neighborhood of Carrollton, so I walked up Canal to Carondelet, and caught the St. Charles trolley line there. The weather was sunny, but not particularly hot, and with the windows open, it was actually quite cool. The St. Charles route through the Uptown was quite an unusual one. Past Lee Circle, it passed boutique hotels and restaurants, beautifully-landscaped Garden District mansions, historic college campuses like Loyola and Tulane, and Aubudon Park and zoo. I also noticed New Orleans’ famous Exposition Boulevard, the street that never was , a “street” that can only be walked. When the trolley line swung northward at Carrollton Avenue, most people got off at the famous Camellia Grill where I had eaten last year, but I continued further north to Oak Street, whose brightly colored row of shops and cafes was quite welcoming. On the corner with Carrollton Avenue was an old bank that had become an Indian restaurant, and another ancient building on the opposite corner (also perhaps a former bank) had become a coffee bar. Down the first block westward on Oak were a gelato bar, a snowball stand called Belle of the Ball, a independent book shop and the Oak Street Cafe. The latter was fairly crowded, in keeping with its good reputation for breakfast, and, as I had heard, there was a live blues pianist performing, but what intrigued me more was the terrific local art work on nearly every wall. On the east wall was a vivid painting of a University of New Orleans basketball player, so realistic that I almost expected him to move at any minute. On the west wall behind the pianist were captivating paintings of jazz bands and tuba players. Unfortunately the prices were all rather steep. As I was eating breakfast, a blues singer from our conference came in wearing a big cowboy hat, and he got up a sang one song with the pianist. Before I left, he told me about a hit song he was getting played on blues radio stations, and, after walking further west down the street, I heard it playing on WWOZ from the speakers out in front of Squeals Bar-B-Que. The Maple Leaf Bar area had been completely fenced off due to road construction, but I still walked down there to see it, and the Jacque-Imo’s Restaurant next door. After I had walked back toward Carrollton Avenue, I ducked into the bookstore for awhile, and then I went across the street to the gelateria for a cold dessert before getting back on the trolley. An older couple sitting behind me were talking about going to the shops on Magazine Street, so I decided to get off where they did and walk down to Magazine, a five-block walk past a large former orphanage called St. Elizabeth’s that now belongs to Anne Rice. But five blocks in the heat of the day is stifling, so by the time I got to Magazine Street, I was both tired and drenched with sweat, and none of the shops in that area interested me much. But there was a store called McKeown’s Books and Difficult Music another few blocks to the south on Tchoupitoulas, so I walked down that way, past a place called Rose’s Jazz Hall, where a young women who had just walked outside called to me and asked me if I was J-Dogg. I thought perhaps it was someone from our conference, but it turned out to be the Shreveport music journalist and musicologist Kathryn Hobgood, who had moved to New Orleans a few years ago, and was now working on her masters at Tulane. She was about to get married, and had been checking out the jazz hall as a possible reception spot. I thought about what an odd coincidence it was as I walked on into the bookstore, where I bought an interesting book about the spiritual churches in New Orleans. Still thoroughly hot, I walked across to the opposite corner to enjoy a snowball at a place that Kathryn had recommended, whose sign boasted of 70 years in business. With that refreshment, I began the long walk back northward to the trolley route, and then I rode the trolley back into the Quarter. After hanging around the conference events at the hotel for awhile, I got my car and drove out to Bud’s Broiler on Calhoun at Claiborne, where I had a charcoal burger with hickory sauce that was delicious, if a little small. Actually, it was small enough that I decided to head down the block to the Frostop and try their Lot-a-Burger with bacon and cheese. The Frostop burger was big, and all right, but I had to say that Bud’s Burger won the competition in my opinion. At the coffee bar across the street, the talk on the outside tables was about the death penalty, perhaps because a New Orleans jury had imposed that ultimate penalty on a young man convicted of shooting five teenagers in the Central City neighborhood last year. The owner had been one of the debaters, but when I walked inside, he soon joined me, and I ordered a cappuccino to go. Back in the quarter, there wasn’t a whole lot going on. The hip-hop showcase was scheduled to be at Peaches Records, and the DJ had set up there, and the New Orleans hip-hop artist Truth Universal was there, but there was little crowd, and the show hadn’t really started yet. The record store had a lot of interesting books about New Orleans, but I really didn’t have much extra money to spend, so I got tired of looking, and walked down past Jackson Square to the French Market where other acts were supposed to be playing for Cutting Edge. Those events had ended at 9 PM, however, and now the French Market was largely dead except for the Cafe Du Monde, where I stopped for coffee and beignets. Finally, with nothing else going on, I walked back to the hotel. Breakfast was at Panera Bread, and then I headed out to New Orleans for the Cutting Edge Music Business Conference, but I stopped in Jackson to have lunch with Charlie Braxton at Majestic Burger, and to pick up the new Ned Sublette book about New Orleans at Lemuria Books. All the time I had spent in Jackson had me running behind schedule, but I got so sleepy south of Jackson that I had to stop in Brookhaven for a cappuccino. The New Orleans rap artist Ms. Tee had wanted to meet with me, so when I got across the swamps and past Manchac and LaPlace, I called her from the outskirts of Kenner, and she suggested that we meet at Copeland’s Social City in Metairie. I had no trouble finding it, but, unfortunately, the menu had changed since the last time she had been there, and it was not only expensive, but just weird. mostly small plates, the tapas menu that’s so trendy nowadays in places like Los Angeles or New York. This was New Orleans, however, so we decided to drive further down Veterans to the Copeland’s Cheesecake Bistro, which was a much better and more diverse menu. We talked, some things about the city’s rap scene, and some about her career, and then went our separate ways, me out to the part of Metairie that had once been called Fat City in search of beignets. Tucked behind the Lakeview Mall, it was hard to see how the nondescript strip malls facing each other had ever been intended to rival the French Quarter, but that’s what the developer who built them had bragged back in the early 1970’s when school integration had started in earnest, and whites began pouring out of Orleans Parish into Metairie like water flowing through the broken levees. Businesses flowed over the line as well, one of them the venerable old Morning Call coffee stand that had proudly stood in the French Market for 103 years, a block northeast of its more-famous competitor, the Cafe Du Monde. When it left the Quarter for Metairie in 1974, people began to realize that something was truly going wrong in New Orleans. Officially the move had been due to “street construction”, but the truth was, most of the place’s long-time customers had probably moved already. Nowadays, Fat City was a garish warren of outdated strip malls with old-fashioned neon signs, and the only thing that seemed “fat” about it might be the beignets at Morning Call. But the coffee stand still proudly advertised that they were open”24 hours”, and they were crowded (with locals, not tourists). The prices were slightly cheaper than the Cafe Du Monde, and I noticed that they didn’t dust the beignets with powdered sugar, but had canisters of powdered sugar on every table for you to do it yourself. From there, I took a spin through West End Park, where I had eaten on an enjoyable promotional trip back in the summer of 2005 before Hurricane Katrina. Although the Joe’s Crab Shack had been rebuilt and opened as a Landry’s Seafood House, the rest of the area was still strangely desolate. Peculiarly, the sand volleyball courts were still there and apparently had been rebuilt by the city, but there was not a trace of the four or so restaurants that sat in a circle at the western end of West End Park the last time I had been there. I felt rather depressed as I headed down Pontchartrain Boulevard and into the city, whose broad expanse of downtown towers suggested a place of infinite wealth and possibility. Any illusions were soon shattered when I exited onto Canal Street, passing an abandoned hotel, three abandoned movie theatres and a vacant office tower with shattered windows, although the street had been planted with rows of beautiful royal palms, and the street’s condition seemed to improve with each block as I drove nearer to the river. The hotel where my conference was being held was the Westin Canal Place at the very end of the street, and after I had checked in, I decided to call it a night. My room featured a window with a broad expanse of the city, looking eastward toward the Faubourg Marigny and across the river toward Algiers. Off in the distance to the east, I could see the flash of radio towers, maybe out at Michoud, and nearer, I could see a big boat negotiating the Mississippi, perhaps an oil tanker. I left the window open on the city and fell asleep on the plush bed. Breakfast with Charlie Braxton and two of his sons at Broad Street Baking Company. Then I drove back to Memphis, but detoured into Water Valley to meet Justin Showah, the owner of Hill Country Records, who had an order of Eric Deaton Trio CDs for me to pick up for Select-O-Hits. The talk in the little grocery store there in Water Valley had been about the weekend death of Memphis music legend Jim Dickinson.